Explore the airport and interact with the different characters to explore their stories. When it comes to products designed for kids, the ones that intrigue the users to explore further will usually succeed. My app pick for today, Tiny Airport, is an excellent example of this. 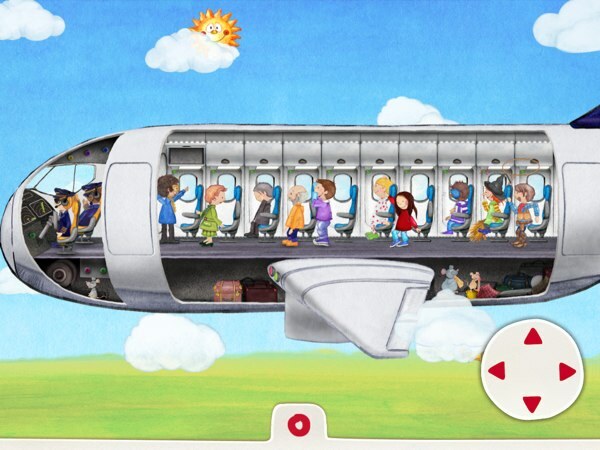 It is an app that, as you might have expected, introduces kids to the activities in an airport and air travel. Highly detailed, it has more than 90 interactive stories to rouse your children’s curiosity. Tiny Airport is organized into three scenes: Check In, Boarding, and Aboard the Airplane. In the first scene, kids will see Lisa arriving at the airport. She will check her baggage and wait in line for the security check. As Lisa waits, kids can interact with the objects in the scene. Every object has a story to tell; for example, there’s an old man who needs help getting his bag onto the trolley just outside the check in counter. Kids can also tap on the other passengers to move into the security check area. In the next scene, kids will help the stewardess extend the connecting bridge from the airplane to the boarding gate. They then make the boarding calls to get everyone into the plane. Again, they are free to explore the scene. They may find nice surprises such as the dancing marshaller. They can also get a minivan to transport the passengers who want to transfer to a different flight. Once they have helped everyone board the plane, they can move on to the next scene. Taking a view of the plane internals, they get to see how the passengers are seated and where their baggages are located. They can also steer the aircraft using the four-way on-screen virtual controller. Tiny Airport helps kids ages 3+ to understand everything they need to know about the airport and traveling by plane. It’s also suitable for first-time flyers. The app has neither text nor narration, but it’s very intuitive to navigate. I recommend accompanying your kids as they play, so you can explain the stories behind each surprise they find in the app. I’m sure you will find new stuff to talk about too. Tiny Airport supports many languages, including Arabic, Chinese, Dutch, French, German, Italian, Japanese, Korean, Norwegian, Portuguese, Russian, Spanish, Swedish, and Turkish. Help the stewardess get the passengers on board while keeping the airplane marshaller on their toes. The app has a surprising amount of details. It amazes me to see so many interactions within a single scene. My kids enjoyed exploring every little detail, but their favorites were the dancing pop star aboard the airplane and the dancing airplane marshaller. I also like how the app provides you with many things to talk about with your kids. For example, you can show them the many use cases of air travels. You can also discuss with them why certain things happen, and why some objects are not allowed onboard. Steer the airplane and see how the passengers enjoy the flight. Tiny Airport is a fun app for kids ages 3+ to explore the various stories about the airport and traveling by plane. The app includes more than 90 interactive stories that involve a wide variety of characters. It’s the perfect app for kids who love to tell their own stories and prefer discovering things on their own.